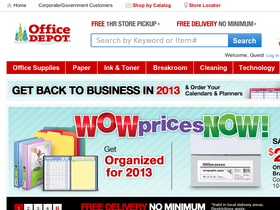 OfficeDepot.com is a global supplier of office products and services. From basic office supplies such as printer paper and labels to office equipment like file cabinets and stylish office furniture, OfficeDepot.com has the office products you need to get the job done. Get the job done for less with discounts, coupons and deals found here on 58Coupons.com. Head on over to Office Depot and save 50% on select shredders. Click link for selection.